If you couldn’t tell by our past reviews, we are a big fan of Little People toys by Fisher-Price in our household. One of the popular toys in our house from our son’s perspective is his Little People Toy Fire Truck. The version we have is officially called the Fisher-Price Little People Lift n’ Lower Fire Truck. It was a gift for our son’s third birthday, and it was one of his favorite gifts that year. 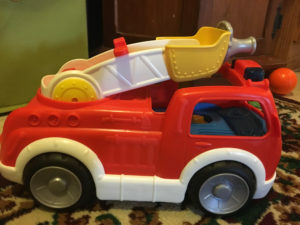 Over the years this fire truck has been on many adventures – ranging from putting out pretend fires to causing epic car wrecks with other toy vehicles. Another big reason this toy became very popular with my son was because he became obsessed with Paw Patrol. Marshall is one of his favorite characters, so this toy fit right into his imaginative play involving paw patrol adventures. There are a lot of great features included as part of this toy – which should bring plenty of fun into your home! 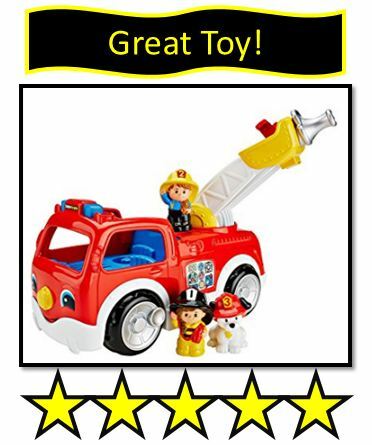 Like all Little People toys, you are going to get a fun and durable toy when you purchase their fire truck. It is recommended for children ages 12 months and up. The truck itself weighs about 2 pounds and is about 13 inches long. It is well built and thick, and it obviously comes in that classic fire truck red color. The fire truck really moves well and can get up to some impressive speeds when pushed hard enough! Attached to the truck is a ladder that moves around in a circular motion – and has a sliding piece on it that can move the fire fighter or fire pup up and down the ladder. It comes with two fire fighter figures and a fire fighter Dalmatian puppy included in the set. My son really liked the fire puppy because it reminded him of Marshall from Paw Patrol. This toy makes a ton of different noises and sings a ton of different songs depending on what you are doing with it. In fact there are over 25 different songs and fire truck sounds it will make. Again, our son loves using this toy as a fire truck- but also as a member of his transportation toy fleet – which means this fire truck will have lots of different toys riding on it and it will be involved with lots of epic crashes….and adventures. This is another toy that is very safe. My 1 1/2 year old will try to ride on it from time to time, but unlike some other train and truck toys that we own, it doesn’t have a flat back so it is much more difficult to ride on than some of those other toys. As a parent I have been known to trip on it from time to time. It does move pretty fast, so your children are going to love crashing into things- including a younger sibling from time to time. The figures and fire truck doesn’t have any small pieces, so there aren’t any choking hazards. Depending on how crazy your child gets during play time, it is light enough to be picked up and thrown a pretty good distance. However, these are some minor concerns and overall this is a very safe toy even for very active children. We give it a three on our danger scale. This toy is going to rank right in the middle of our toy annoyance scale. The big reason for that ranking is because of the vast amount of songs and noises it can make. 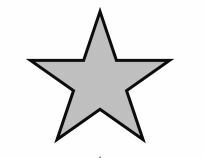 From a personal standpoint, I don’t think there is anything more annoying than hearing a random song playing in the middle of the night as you trip over the toy your child left out in the middle of the hallway. Especially when your child promised to put that toy away. Between the noise and tripping factor, we are going to give this a five out of ten on that annoyance Scale. This is a really solid toy. It probably isn’t one that’s going to become the cornerstone of your child’s toy collection, but is going to be a great supplement toy to all the other adventures, games, and toys your child plays with. Of course if your child loves fire fighters and fire trucks, this toy will be a hit. I give this toy a Silver Star rating, because in our house it really fills that supplemental toy role very well.